I love cookies. I love warm, gooey cinnamon rolls. Therefore, it only makes sense that I would attempt this recipe from Kohls’ “Crazy About Cookies” cookbook. The dough has maple syrup in it, which is definitely interesting (and not as messy as I thought it would be). These cookies take a while to make because you have to harden that syrupy goodness in the fridge before you roll out the dough, but they were delicious. 1. Mix flour, sugar, and butter in a stand mixer. 2. Add maple syrup and apple juice. 3. Refrigerate dough for 2 hours. 4. 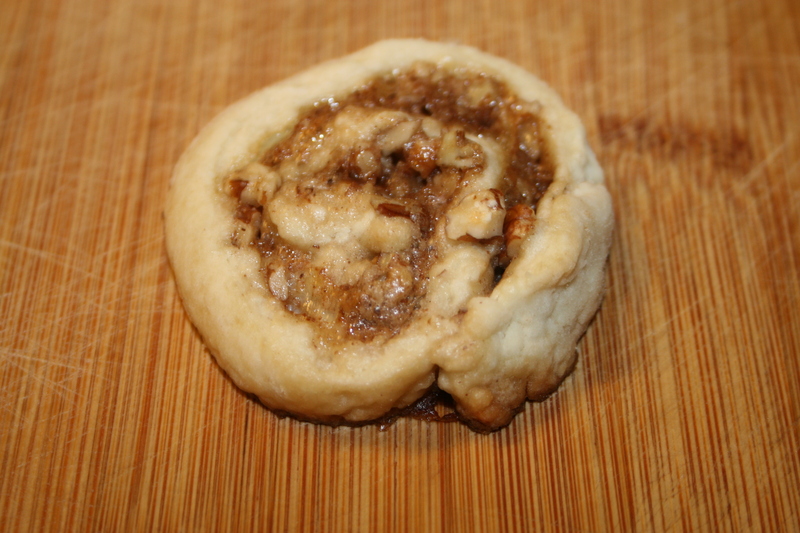 While the dough is in the fridge, make the swirl filling by combining sugar, pecans, and cinnamon in a small bowl. 5. Separate the dough into two batches. Roll out the first batch on a floured surface. 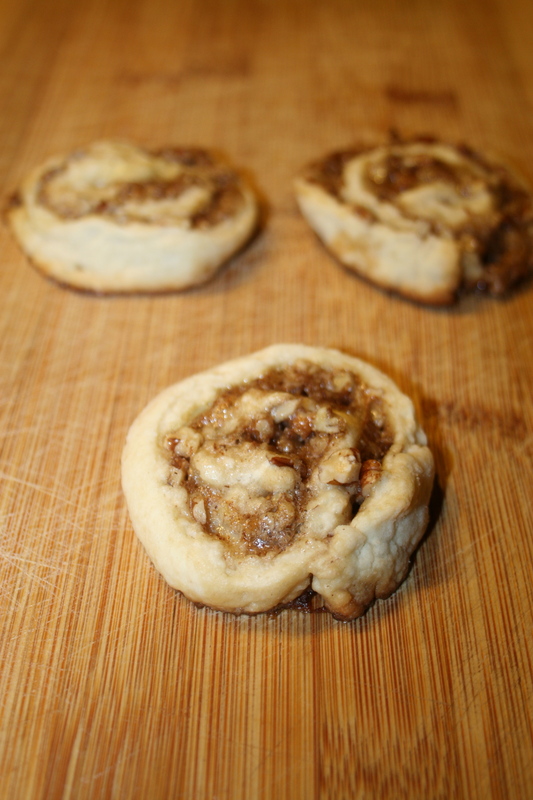 Be careful not to spread the dough too thin, or it will break apart when you attempt to roll it up. 6. Lightly brush the dough with the egg whites, and cover with half of the filling. Gently roll up the dough, creating a log. Set aside. Repeat with the other batch. Set in fridge for 1 hour. 8. Cut logs into generous slices. Place on greased cookie sheet and bake for 25 minutes. I had a little accident with one of my logs because I spilled too much egg white onto it. It broke apart and although I tried to salvage it, that entire half of dough was useless. I would like to create these again for more practice and I would like to attempt a cream cheese icing on top to make them more like real cinnamon rolls.